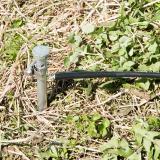 This stainless steel clamp holds insulated electric fence wire firmly to an energizer's ground rod. 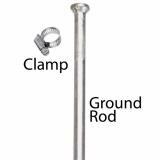 Slide clamp onto ground rod. 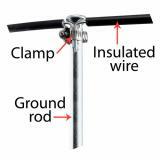 Near the top of the ground rod, insert the insulated cable between the clamp and rod. Tighten the clamp in place. 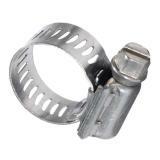 Although you can get these at any hardware store, it was convenient to order them with my grounding rods to have them all arrive ready to go at my house!